EFFORTS to break the round-the-world powerboat record ‘will take place next year’, organisers have pledged – three years later than planned. Portsmouth’s ocean racing legend Alan Priddy says his bid to race around the globe in a state-of-the-art powerboat are now back on track. 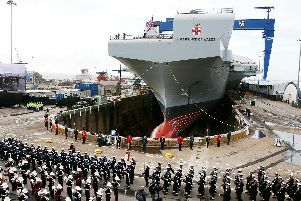 It comes after the ambitious plan, led by his Team Britannia made up of veterans and maritime experts, has been hindered by delays and financial difficulties. Initially, when the bid was announced in January 2015, it was hoped Mr Priddy’s hi-tech vessel would be ready by October that year. However, delays have plagued the process pushing things back further than anticipated. But with the New Year now in sight, officials from Team Britannia say they are back on track to take on the challenge, after an addition £1m sponsorship deal was secured. The cash has allowed them to fund the final phase of construction of their 80ft boat. Spokesman Alistair Thompson said: ‘Ron Dennis F1 legend said “in the pursuit of excellence there is no finishing point” – he’s right. It has been tough at times. The craft is being built at the Hayling Yacht Company’s HQ, in Mill Rythe Lane, on Hayling Island. Designed by professor Bob Cripps, former technical director of VT Halmatic, it will utilise innovative ‘wave-slicing’ technology, making the vessel super-efficient, cutting fuel consumption by up to 30 per cent. A revolutionary fuel emulsion, a mixture of diesel, water and emulsifier will power it. The emulsified fuel cuts harmful emissions such as particulate matter and nitrogen dioxide. It’s hoped the vessel’s hi-tech kit will help her crew beat the current record of just under 61 days. Team Britannia’s attempt will see the squad circumnavigate the globe starting and finishing in Gibraltar, passing through the Suez and Panama Canals and cutting across the Tropic of Cancer and the equator with stops at Puerto Rico, Acapulco, Honolulu, Guam, Singapore, Oman and Malta. If things go well, The News understands the bid will begin on Sunday, October 21.